Central Rada (Центральна Рада; Tsentralna Rada). 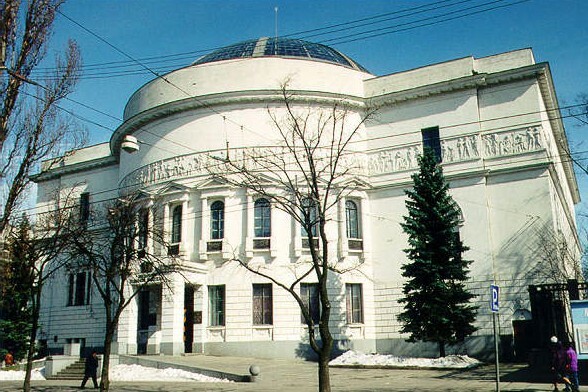 At first, an all-Ukrainian center that united political, community, cultural, and professional organizations; later, after the All-Ukrainian National Congress (17–21 April 1917), the revolutionary parliament of Ukraine that directed the Ukrainian national movement and by the four Universals of the Central Rada led Ukraine from autonomy to independence. The Central Rada was founded in Kyiv on 17 March 1917 on the initiative of the Society of Ukrainian Progressives with the participation of other political parties. Mykhailo Hrushevsky was chosen in absentia as the chairman of the Rada, with Dmytro Antonovych and Dmytro Doroshenko as his deputies. After the All-Ukrainian National Congress the Rada was composed of 150 members, elected from Ukrainian political parties, professional and cultural organizations, and delegates from the gubernias. At the congress a new presidium of the Rada was elected, with Hrushevsky as president and Serhii Yefremov and Volodymyr Vynnychenko as vice-presidents. To take care of current matters, the Rada chose an executive committee, later renamed the Little Rada, which consisted of members of the presidium, secretaries of the Rada, and two representatives from each political party. All important matters were first decided by meetings of the Little Rada; later the proposals drawn up were ratified by the plenum of the Central Rada. 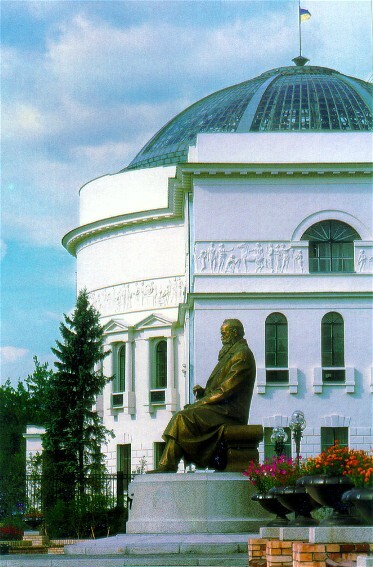 During its existence the Rada held nine plenary sessions. Even before the proclamation of the First Universal (see Universals of the Central Rada), membership in the Rada was increased by 130 members delegated by the second of the All-Ukrainian military congresses (18–23 June 1917) and 133 members of the All-Ukrainian Council of Peasants' Deputies, elected at the first of the All-Ukrainian peasant congresses (15 June 1917). 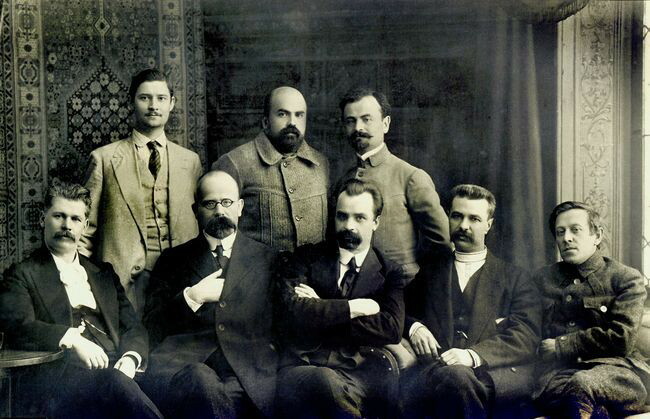 After the proclamation of Ukrainian autonomy (in the First Universal, 23 June 1917), the Rada choose the General Secretariat of the Central Rada—the autonomous government of Ukraine. Having won recognition by the Russian Provisional Government (proclaimed in the Second Universal, 16 July 1917), the Central Rada increased its membership by 100 representatives elected at the first of the All-Ukrainian workers' congresses (24–27 July 1917) and by representatives of the national minorities. By the end of July 1917 the Rada consisted of 822 deputies, who represented the following groups: the All-Ukrainian Council of Peasants' Deputies (212), the All-Ukrainian Council of Military Deputies (158), the All-Ukrainian Council of Workers' Deputies (100), non-Ukrainian workers' and soldiers' councils (50), Ukrainian socialist parties (20), Russian socialist parties (40), Jewish socialist parties (35), Polish socialist parties (15), cities, towns, and gubernias (84), and professional, educational, economic, and community organizations and the national minorities—Moldavians, Germans, Tatars, Belarusians (108). Out of the 822 members, the 58 members of the Little Rada were chosen, with 18 of these representing the national minorities. On 21–28 September 1917 the Central Rada held the Congress of the Peoples of Russia in Kyiv. After the Bolshevik seizure of power in Russia, the Rada proclaimed the Ukrainian National Republic, designating its territory and its federal relationship with Russia (Third Universal, 20 November 1917). At the same time the Rada passed a law on elections to the Constituent Assembly of Ukraine, as well as several other laws (on the courts, the printing of UNR credit notes, etc). The Rada had the support of the majority of the population of Ukraine, as was shown in the election to the All-Russian Constituent Assembly on 25 November 1917 (Ukrainian parties received 75 percent of the vote; the Bolsheviks, only 10 percent). As early as the end of November 1917 the Bolsheviks were preparing to seize power in Ukraine. The Bolshevik government of Russia sent an ultimatum to Ukraine (17 December 1917), which the Rada rejected. The Bolshevik army then began its military campaign against Ukraine. The All-Ukrainian Congress of Workers', Soldiers', and Peasants' Deputies, convoked in Kyiv on 17 December 1917, proclaimed its complete confidence in and support for the Central Rada. The Bolshevik deputies left for Kharkiv, where, on 25 December, they established a rival government, the People's Secretariat, opposed to the Central Rada and the General Secretariat. At the same time the Rada sent a delegation to the peace negotiations with the Central Powers in Brest. 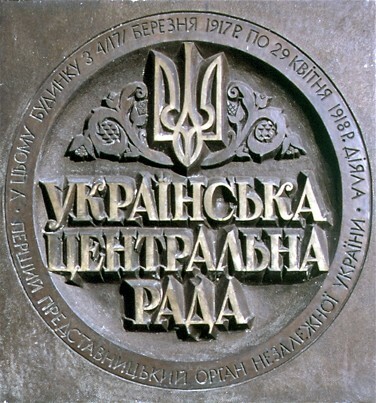 At the height of the Ukrainian-Soviet War and in the midst of the peace negotiations, the Central Rada proclaimed the Fourth Universal (25 January 1918), which declared the Ukrainian National Republic an independent and sovereign state; the General Secretariat of the Central Rada was renamed the Council of National Ministers of the Ukrainian National Republic. Following the declaration, the Central Rada passed a series of laws, establishing the eight-hour work day, land reform (see Land law, Land reforms), and, during its stay in Zhytomyr and Sarny in Volhynia, laws on the monetary system, a national coat of arms, citizenship in the UNR, and the administrative-territorial division of the territory of Ukraine. 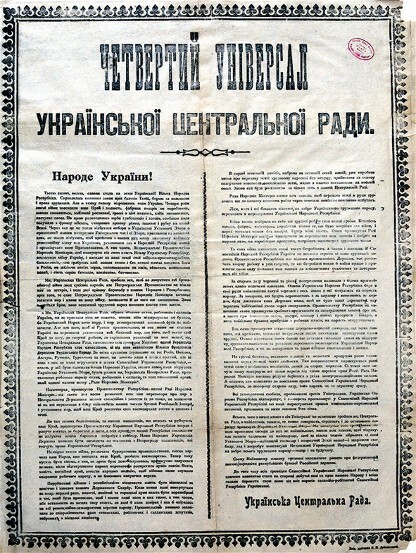 The most important legislative act of the Central Rada was the adoption of the Constitution of the Ukrainian National Republic (29 April 1918). The presiding officer of the parliament was simultaneously president of the UNR. Mykhailo Hrushevsky was elected the first president. After the signing of the Peace Treaty of Brest-Litovsk (9 February 1918), the German army took over the Ukrainian territory that had been occupied by the Bolsheviks, but conflict ensued between the Germans and the Ukrainian National Republic because of German interference in the internal affairs of Ukraine. On 28 April an armed German detachment even broke into a meeting of the Central Rada and arrested two ministers of the UNR. On 29 April a coup took place with the support of the German army, and Gen Pavlo Skoropadsky was proclaimed hetman of the Ukrainian State. Hetman Skoropadsky dissolved the Central Rada and the Little Rada by an edict and revoked the laws that had been passed by them. During its existence the Central Rada was headed by M. Hrushevsky. Its deputy-heads were Serhii Veselovsky, Mykola Shrah, Andrii Nikovsky, and F. Kryzhanivsky, and its secretaries were Mykhailo Yeremiiv, Mykola Chechel, Antin Postolovsky, Ya. Levchenko, and Yevhen Onatsky. Its governments went through multiple changes under the leadership of Volodymyr Vynnychenko (28 June 1917–30 January 1918) and Vsevolod Holubovych (30 January 1918–29 April 1918). The official publication of the Central Rada was Visty z Ukraïns’koï Tsentral’noï Rady (April–November 1917), while the official publication of the government of the Ukrainian National Republic was Vistnyk Heneral’noho Sekretariiatu Ukraïny, which began publication in November 1917. A referral to this page is found in 159 entries.